This week, US-based New York magazine (NYmag) published an article featuring 35 women who’ve accused actor Bill Cosby of sexual assault. 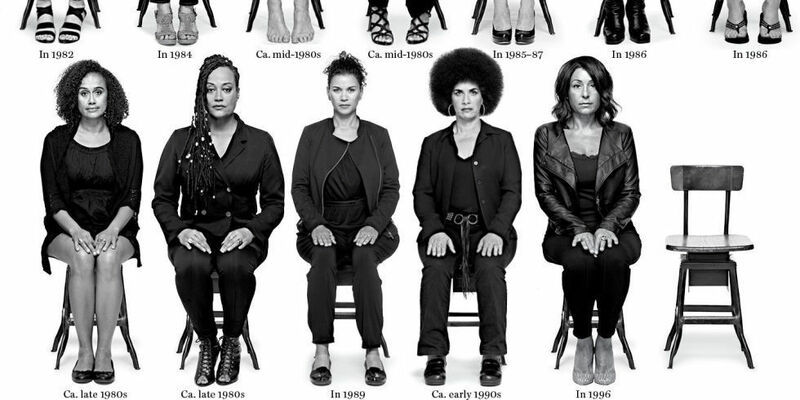 A big talking point was the empty chair pictured, which represents the 11 other women who have accused Bill Cosby of sexual assault (and other potential victims), who are not featured in the article. The article’s impact was bigger than the NYmag’s journalists imagined and soon, the hashtag #TheEmptyChair was trending on social media. #TheEmptyChair prompted several tweets from people expressing solidarity with victims of sexual violence. If #TheEmptyChair is you, I believe you. Journalist Elon James White, who started #TheEmptyChair, received dozens of messages from victims of sexual violence, sharing their experiences. They also note that allegations regarding Bill Cosby’s conduct only gained momentum after a video clip of comedian Hannibal Burres speaking about the allegations went viral on social media last year. Bill Cosby was accused of sexual assault as early as 2005 (click here for a full timeline of related events). However, even as more and more women came forward to speak about their assaults, many people still defended Cosby. Hours after NYmag published the Cosby story, their website became inaccessible for hours after a suspected Denial of Service attack. A hacker who later took responsibility for the attack, claims the attack had nothing to do with the Cosby’s story. Although it may be true that the motivations for the attack on NYmag’s website was unrelated to the Cosby feature, people who speak out about against sexual violence are often harassed or silenced online. In 2014, feminist media critic Anita Sarkeesian, who vlogs about representations of women in gaming, fled from her home after receiving death threats. South-African journalist and author, Charlene Smith has also encountered online harassment. She spoke to me about her experiences with a particularly relentless harasser on social media. Smith says, “He first came after me on Facebook by messaging to my inbox crude and vicious notes. I blocked him. Smith says the harassment continued even after she moved to the United States. This time, it was on Twitter. In dealing with online harassment, one challenge is that many victims do not know their attackers. Another problem is that when online harassers are blocked, on sites like Twitter, they can start new accounts to continue the harassment. Recently, to commemorate Women’s Month, Marie Claire South Africa announced their #MCInHerShoes campaign. The campaign features 18 male celebrities who pose in high-heeled shoes to “stand with women”. The campaign was met with resistance, and accused of trivializing women’s issues. Part of the criticism included Marie Claire magazine’s choice to draw attention to 18 men for women’s month, as well as their choice to include who have come under fire for sexism and alleged abuse, such as Gareth Cliff and Dj Euphonik. Writer Louise Ferreira, describes the #MCInHerShoes campaign as “a cheap gimmick” in an article for Women24. #QueerStruggles and #RhodesMustFall are examples of Twitter campaigns which have brought to light the injustices faced by marginalized groups. What these campaigns did well was push back against heterosexism and institutional racism, by creating awareness. What Marie Claire ends up doing, as pointed out by Ferreira, is using the reach of Twitter and the fact that August is Women’s Month to further themselves in the name of standing against violence. For some, it may not be clear why there is such an uproar over Marie Claire’s efforts, particularly since they attempted to bring men into the gender conversation. @AspasiaKarras @marieclaire_sa how does putting men in high heels bring them into the debate when they're not critically engaging w/ issues? A lot of the time, challenging social norms such as the inferior status of women in society is (and should be) an uncomfortable learning curve, especially for the people those social norms favour. I gather Marie Claire’s campaign aimed to make the men involved ‘uncomfortable’. And heels are, for many people, uncomfortable. However, #MCInHerShoes made more people uncomfortable, by prioritizing the experience of wearing heels over the discomfort caused by street harassment, domestic violence and the threat of sexual assault and centering men in doing so. I will never understand why we need the "male stamp of approval" to show that violence against women is unjust? Marie Claire SA: FAIL. Many also point out that, by associating high heels with womanhood, the campaign also plays into gender stereotypes. This does very little to disrupt the status quo, where a patriarchal system constantly defines women as being different and lesser to men. Women’s Month is important in the sense that it can highlight gendered violence which still plagues our society. That said, this could be done women without reinforcing the idea that men and women are inherently different and that there are two, rigid expressions of gender. There is also a lot of work which needs to be done to include trans women and gender nonconforming people in campaigns for equality, as they often face discrimination for not fitting into gender norms. The #MCInHerShoes campaign plays into established rules about what it means to be a woman and what it means to be a man. At first glance, it may seem useful, but upon deeper analysis, the campaign trips up and falls short. Last week, I wrote about the difficulties of discussing social justice issues, such as racism, on online platforms. Continuing from that, I’d like to explore a silencing tactic which has often been used online to deny or dismiss issues of injustice: derailing. To derail someone in an online conversation is to make a statement that shifts the focus of the conversation away from the original topic. Derailment is a problem because it makes marginalised people have to put disclaimers on everything they say. When a person talks about being discriminated against, derailing them detracts from the point they are trying to make, because they then have to put qualifiers before their point is heard. For instance, if a woman complains about recieving street harrassment from men, someone may defensively respond “But not all men do it!”. Basically, derailment wastes time because it distracts everyone from the issue that has been put forward. In conversations about social problems like racism and sexism, which affect specific groups disproportionately, saying things like “all lives matter” is derailment because it dismisses a social injustice. In using the phrase #BlackLivesMatter as Moshikaro did, the intention was to highlight that the problem of institutional racism disproportionately affects black people. At the time this comment was made, the recent spate of xenophobic attacks had not started. Drawing another issue of injustice in such conversations in this way is a derailment tactic. The problem here is not that the other social injustice issue doesn’t matter. It’s more that this kind of derailment hinders important conversations about injustice by fragmenting them. Of course, every person is privileged and oppressed in different ways. For this reason, it is important to look at the way racism and gender discrimination (for instance) intersect in people’s lives. However, it is possible to have such conversations without derailing others when we discuss social justice issues on the internet. Despite efforts by some to derail the #RhodesSoWhite conversation, the author of the post, Lesego Moshikaro received some constructive responses to it, both privately and publically. “Something beautiful also came out of this – I got mostly white students asking what can be done, what they should do, how to get involved etc. That’s a start. That’s a good start.”, she added. Following the emergence of the Rhodes Must Fall protests at the University of Cape Town, Rhodes University students began to discuss the issue of institutional racism in their own context. Her post attracted over 600 comments by Rhodes students, led to the creation of the #RhodesSoWhite hashtag, and resulted in heated debate (both offline and online). Much of the discussion on Lesego’s post illustrated some of the challenges of discussing about social justice issues online. The first challenge of engaging around social justice issues on the internet is that online spaces are usually unfiltered and unmonitored. It can be very difficult to establish what impact the dialogue will have offline or IRL (in real life). Although the discussion can be widely visible, as was the case with Lesego’s post, it’s hard to tell whether people are meaningfully participating and learning from the discussion or if they just there because they have FOMO. Another challenge related to making social movements visible online is that often, online platforms are not safe spaces for marginalised people. Making issues like institutional racism visible on an online platform is risky for marginalised groups because they could be exposed to hate speech or triggered. In order for online platforms such as this, to become safe spaces for marginalised groups, some form of moderation is needed. Currently, the only way in which posts are ‘moderated’ on the Rhodes SRC Facebook group is if they are reported to and removed by Facebook, or deleted by those who post them. While moderation would be feasible for a platform such as a Facebook group, it is more difficult to make platforms such as Twitter and comment sections of websites safe spaces. A third challenge of engaging in online dialogue about racism, sexism, classism and other forms of oppression is that such dialogues are often subjected to silencing. In the online context, silencing is when people who bring up a social justice issue have their grievances dismissed or are discouraged from speaking up by (usually privileged) others. Silencing is a big problem because it de-legitimises the legitimate concerns of marginalised groups. “We all need to stop playing the victim.” – People who are bringing up institutional racism at Rhodes are playing the victim. “You haven’t suffered [from apartheid] personally.” – Claims that (black) students are still negatively affected by the impacts of apartheid at present are not legitimate, because apartheid ‘ended’ in ’94. ”Maybe you can join my soup kitchen in Joza (township) & I can show you what its like to HELP the community.”* – Institutional racism is not the biggest problem in society. Our efforts to better society should focus on those who are ‘really’ oppressed. Another variant of silencing was something like, “If racism really exists at Rhodes University, why are people only speaking up now?” This type of comment minimizes the grievances of students who challenge institutional racism, making it seem like they’re just ‘jumping on the bandwagon’. As we can see from all these examples, the types of resistance that social movements meet in real life don’t disappear when the movement is taken to the digital streets. In my next blog post, I’ll be looking closer at the silencing tactics used when social movements go digital. In the mean-time, have you experienced any of the above problems when talking about social justice in online platforms? Did you learn something new from online engagements about racism that have taken place in the past few weeks?